These days many anglers seem to prefer fishing for carp in the spring, summer and autumn seasons of the year. There are very few that will try to target large carp in the winter. Maybe it’s the cold weather, or it could be that some believe the carp will be hibernating in the deeper water and will not want to feed much. Well, this is not always the case; in fact, most carp will still feed regularly during winter, albeit in smaller quantities! So if carp are still available to catch in the cold of winter, what baiting strategies should we employ to be successful at catching carp during the wintertime? Firstly, one thing I will say here, we should be careful with the amount of bait we use during winter. It can be so easy to over bait a swim at this time of year. Actually, heavy baiting can work during winter, but it requires the right circumstances - if a large group of carp are feeding in one area, then it’s possible to get away with piling in the bait. However, this will be a rare occurrence so it’s best to under feed carp rather than over bait in winter. The use of PVA bags is a very effective baiting tactic. However, in winter you should be looking to reduce the amount of bait you put out into the swim overall. Therefore, it makes perfect sense to use a PVA stringer of 2 or 3 boilies for each cast instead of PVA bags. This is more important if you intend to use one rod for roaming around the swim fishing for bites or a single fish. If a bag full of bait was attached for each cast, imagine how many baits would be going out in just half a day! Carp will probably feed more often if the food is small and easily digested. The cold water temperature affects the digestive enzymes in a carp’s gut so some fats/oils are harder for them to digest. Using smaller baits or chopping up boilies can help a carp’s digestive process. 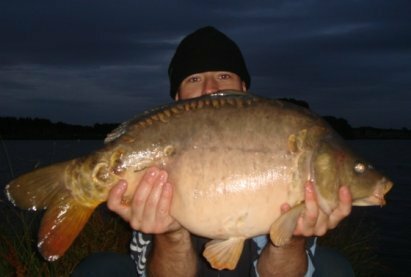 Therefore, a carp may be more inclined to take a few smaller baits over one big, monster boilie! Chopped boilies also give the advantage of leaking out more scent to attract carp towards the hookbait. Carp will still be attracted to the smell of food signals in the winter. Although, creating a large food signal without piling in too much bait can be tricky. Using baits that breakdown rapidly into a mush is a great way to send out a food signal without over-doing the bait. Many different types of breakdown pellets can be bought from all leading tackle shops online. For the same reasons as for number 3, a method mix using breadcrumb can help send out a big food signal. The trick is not to include any food items when mixing up the groundbait. Add in plenty of liquid attractants, but leave out the food items, well maybe add just a few! This way you’re sending out plenty of food signals without the fillers! 5. Why Not Use Singles! Try using single hookbaits in winter. Single hookbaits can be one of the best baiting tactics of all. There are many benefits to using singles. Firstly, the carp cannot become too full on any freebies before getting to your hook bait, simply because there are none! Plus, many carp in UK waters are becoming accustomed to the safety associated with finding a single, odd bait on its own. This could be because the angler has usually gone home, and groups of fish may have polished off the majority of bait leaving just one or two in the area without the danger of rigs. The result is one or two baits have been left dotted around the swim. Eating these single baits without a resulting capture means carp have learned to associate these situations as safe. Therefore, fishing with single hookbaits can be very effective at any time of the year. However, in the winter it just makes more sense to use them! If you manage to get some carp feeding, then don’t be afraid to get the bait in. You want to give them a reason to stay around. The trick is to use little-and-often baiting tactics in this situation, then there’s always the chance one will take your hookbait at any time. When you do drop in some free baits, try scattering them about more. In the winter, carp seem to prefer picking up one or two items at a time. Maybe they analyse the contents of each item in order to see if their carp digestion can cope with the ingredients. I'm really not sure here, but whatever the reason, scatter a few baits around the swim rather than creating big, tight clusters of baits. It’ll also help keep the fish on the move allowing them to build up an appetite. 8. Maggots & Worms –WOW!! Don’t forget to try maggots or worms for catching big carp. Using real live bait is probably one of the best baiting tactics one can use in the wintertime. They will move about on the bottom which encourages fish to take them at any time of the year. Do not neglect their effectiveness! Some flavours are less soluble in cold water. Some tend to clump together while others can float. A few are soluble and disperse evenly in cold water. I believe the latter are best to use in winter because the flavour stands more chance of reaching a passing carp. If your attractant sinks to the bottom and clumps, there’s less chance it’ll be effective for attracting carp in the vicinity. However, I have read that very good winter baits use a combination of all flavours. The floating types will travel upwards, the dispersing type will travel outwards, and the clumping types will stay in the area until it becomes disturbed. Sounds like the best for winter carping to me! Think twice about your winter baiting tactics!